WASHINGTON—Even as they united behind journalist Kaitlan Collins after the Trump administration barred her from attending a press conference with the president, the White House press corps reportedly admitted Thursday that they wished their show of solidarity over a banned reporter could be for a better news organization than CNN. 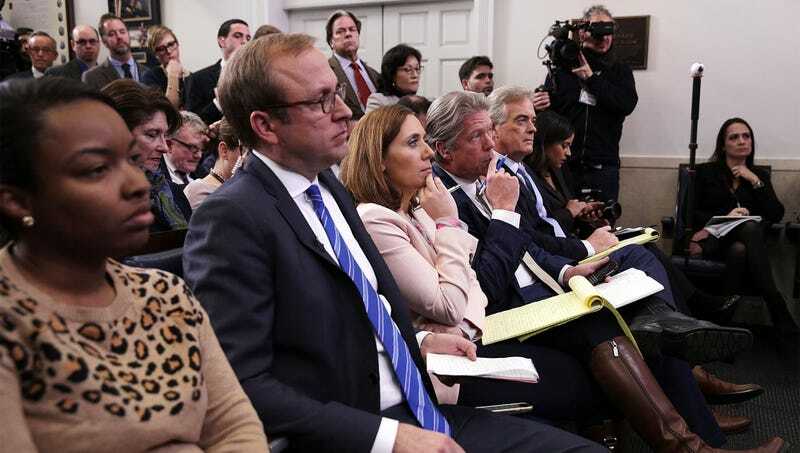 “Obviously, we’ll stand behind any news outlet that has its access suspended, but did it really have to be CNN?” said NBC News chief White House correspondent Hallie Jackson, echoing the sentiments of her colleagues who begrudgingly agreed that any move to infringe upon one reporter’s journalistic freedoms, even if it was someone from CNN, was an assault on the entire free press. “Although we’d much rather stand up for someone from, say, the New York Times, or C-SPAN, or, Christ, even The Hill, it’s important to inform the White House that blocking any news organization from a press event will not be tolerated. Journalists are here to ask tough questions and keep the public informed, and even if they represent a network that never does those things, a ban like this sets a grave precedent. Solidarity with—ugh—CNN.” At press time, CNN senior White House correspondent Jeff Zeleny issued a statement thanking the press corps for coming together to support holding the powerful accountable and also for whatever it is that CNN does.